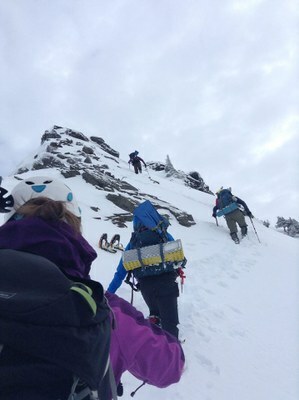 Anyone with sufficient experience (either within the Mountaineers, on their own, or with other programs) in scrambling, leadership and trip planning may apply for their Scramble Leader badge. Process: Prospective leaders should contact the course leader for a preliminary review of their experience once they believe that they fulfill or are close to fulfilling all of the above requirements. After obtaining permission, the prospective leader will register for the course and then meet with the course coordinator to review their experience and skills in detail to identify any gaps. The course coodinator may recommend additional experience, training, or courses to fulfill the above requirements. Upon completion of the full set of requirements and approval of the Foothills Scrambling Leadership sub-committee, a prospective leader will be granted provisional status and given permission to lead two mentored trips with different mentors. The mentors will evaluate the prospective leader's skills in leadership & group dynamics, setting up & managing the trip safely, mountain sense and judgement. Upon the positive recommendation of both mentors and final approval of the Leadership Committee, the prospective leader will become a Scramble leader. Permission to lead Winter scrambles will be granted separately and has additional requirements.